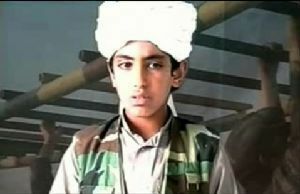 (Newser) – One of Osama bin Laden's sons may have escaped the raid by Navy SEALs, according to ABC News and British papers the Telegraph and Daily Mail. It seems more guesswork than anything at this point, though. Bin Laden's three widows have reportedly told Pakistani authorities that one son has not been seen since the raid. The best guess is that they're referring to bin Laden's youngest son, Hamza, thought to be around 19 or 20 and a close confidante of his father. His mother is one of the detained widows. Maybe he "escaped" on the same helicopter that took his father's remains - which means he is under intensive "debriefing" right now. Poor kid. Talk about being a member of the cursed sperm club. Imagine being born through that seed line.